Cedar Rails has two bedroom cottages vacation rental available, which can be rented as a four bedroom, two bathroom setup by using the connecting door between the two cottages. They are located side-by-side, with verandas facing an open yard, and access to a volleyball and horseshoe area in back. The two bedroom cottages vacation rental sleep four, with two double beds. Each cottage is equipped with a futon/sofa bed which allows extra sleeping for up to six occupants. There is a charge for extra occupants over four. Children and infants are considered \"persons\" for occupancy limits. 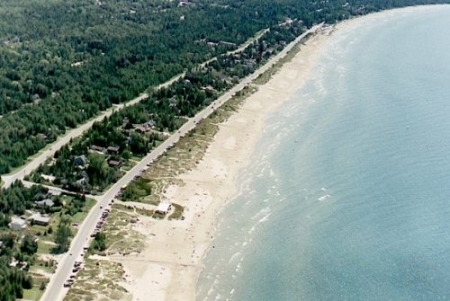 Best Fresh Water Beach in Ontario.